This qualification is intended for internal verifiers/internal quality assurers who are responsible for quality assuring qualifications systems. Unit 402 is the performance Unit and as such, Unit 402 candidates will have to demonstrate their competence by internally quality assuring assessors and systems. 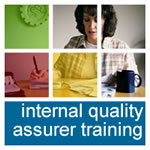 Once the training has been completed, Unit 401/402 candidates will have to complete an assignment/professional discussion to explain in detail to show that they know and understand ‘the internal quality assurance of assessment processes and practice’ plus provide evidence as per the assessment plan of their competence as Internal Quality Assurers in the work environment. To complete Unit 402 Internal Quality Assurer Candidates MUST be observed internally quality assuring assessors and systems.